Flowery sweet aroma combined with a pleasantly sweet aftertaste, Chinese Oolong tea never loses its appeal no matter how often you drink it. Chinese Oolong tea increases your body energy, promotes metabolism, controls obesity and helps to regulate ageing. Gui Hua Oolong is produced by scenting Taiwanese Oolong tea with fresh Osmanthus flowers, combining the sweet osmanthus fragrance with the fruity sweet nature of Taiwanese Oolong. The recipe of Gui Hua Oolong has been around for a long time. This tea was especially popular among the ladies in the past as they believe that drinking it can help them enhance their beauty. In any case, Gui Hua Oolong is truly a lovely tea suitable to be shared with your friends and family anytime. When infused, the tea leaves release the lovely sweet and pleasant aroma of Osmanthus flower. The tea is refreshingly light and has a hint of peachy flavor. 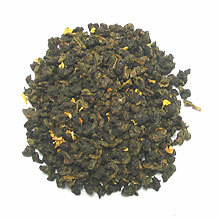 You will find some golden yellow Osmanthus flowers mixed in with the Oolong tea leaves. During the infusion, the flowers will float on top of the surface of the water, creating a beautiful "autumn lake"-like visual display.